Source of Support: Vice Chancellor for research, Isfahan University of Medical Sciences, Conflict of Interest: None declared. Background: Despite advances in the field of intravenous therapy, phlebitis is still a common complication of peripheral venous catheter and finding an appropriate solution to prevent and reduce the incidence of this complication remains challenging. One of the methods used in reducing the incidence of phlebitis is the use of saline lock, which is forgotten in most hospitals. Therefore, this study aimed to evaluate its impact on the incidence and severity of phlebitis. Materials and Methods: In a single-blind (the researcher) clinical trial, 88 patients with peripheral venous catheter admitted in cardiac care units in selected hospitals of Isfahan University of Medical Sciences, Iran, were selected through convenient sampling method. They were randomly divided into two groups of intervention and control groups using random number table. 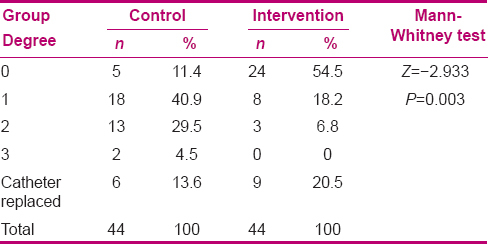 The intervention group received 3 ml of 0.9% normal saline sterilized before and after each intravenous drug or every 12 h. However, in the control group, the intravenous drugs were given as routine and saline lock was not used. The evaluation of intravenous catheter regarding the incidence of phlebitis and its degrees using Jackson’s Visual Infusion Phlebitis Scale was performed 6 times within 72 h (every 12 h). Results were evaluated by SPSS software using descriptive statistics, Chi-square test, t-test, and Mann–Whitney test. Results: Results showed that there was a statistically significant difference between the two groups regarding the degree of phlebitis (P = 0.003). The percentage of phlebitis incidence in the control group was 88.6% and in the intervention group was 43.2%. There was a statistically significant difference between the two groups (P < 0.001). The risk of incidence of phlebitis in the group without saline lock (control), compared to the intervention group, was 10.3 times greater (CI = 95%). The incidence of phlebitis in both groups increased with increase in the duration of catheter placement. Conclusions: The results of this study showed that the use of saline lock in the intervention group compared to the control group, in which saline lock was not used, can have a significant impact on reducing the incidence of phlebitis and its degree. Intravenous treatment saves the lives of many people, and placement of peripheral venous catheter is the most common invasive procedure in clinical practice. About 150 million peripheral venous catheters are used annually in America., However, one should not forget that like any other invasive procedure, it has side effects. One of the most common complications associated with intravenous therapy is phlebitis. Its prevalence in the UK was reported to be from 20 to 80% and in Iran as 69%. Based on the Nursing Society of Intravenous Fluid, the accepted rate of phlebitis for each population is 5% or less. In order to detect and identify the symptoms of phlebitis and determine its degrees, the Infusion Nursing Society suggested Jackson’s Visual Infusion Phlebitis (VIP) Scale. 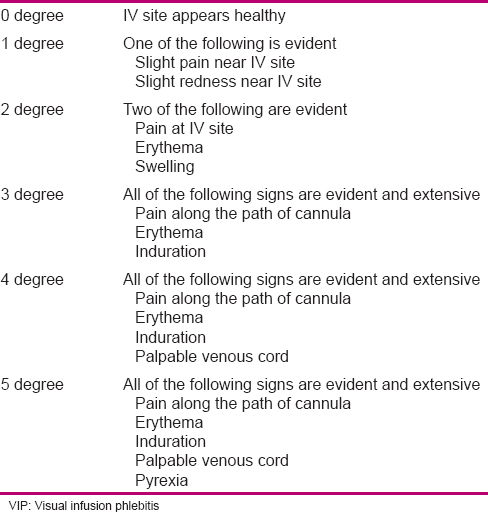 In this scale, the severity of phlebitis with regard to symptoms such as redness, pain, swelling, fever, edema, forming a tight intravenous rope, and fever is graded from 1 to 5, and it is shown in [Table 1]. With this scale, phlebitis can be identified in its early stages and treated before it causes severe complications. High incidence of phlebitis in hospitalized patients causes problems such as sepsis, pain, increased length of hospitalization and treatment, economic burden, patient stress, increased workload of staff, and even, in rare cases, pulmonary embolism and death., In addition, approximately US$ 25 is spent for every placement of peripheral venous catheter, and this expense does not include patient’s problems and the nursing time spent. Due to the high incidence of phlebitis, many studies have been conducted regarding its prevention and treatment and all of them show the importance and sensitivity of the issue from the perspective of the researchers. Despite the many options that exist in the treatment and prevention of phlebitis, providing a suitable solution to prevent and reduce the incidence of this complication remains challenging. Given the high prevalence of phlebitis, the need for developing new methods of treatment and prevention can still be sensed. Many studies have been conducted to evaluate and compare the effects of saline lock (3 ml of 0.9% normal saline injection intermittently into the catheter) and heparin lock (flushing 1–3 ml solution containing 10–100 units of heparin per milliliter) in maintaining an open venous catheter and reducing its complications, especially for phlebitis. In the study by Fojital et al., saline lock was as effective as heparin lock in preventing phlebitis, while in the study by Bertolino et al., the rates of vein occlusion and incidence of phlebitis were higher in the saline lock group. The study by Alexander compared these two methods and revealed that saline lock was preferred to heparin. He also quoted Le Duc (1997) in that using normal saline saved about US$ 27,594 toward the costs of nursing care and the solutions used. Campbell et al. studied the effects of using saline lock for different number of times on the problems caused by peripheral vein catheter. The results of their studies showed that in the group in which saline lock method was used once daily, there were less complications, such as phlebitis progress, compared to using it every 12 h or every 8 h. Moreover, Myrianthefs et al. reported that the problems caused and the rate of incidence of high degree of phlebitis in the group with saline lock was higher than in the group which did not use saline lock. Due to the contradictions in the application of this method as an appropriate solution in the prevention of phlebitis and its associated problems, the present study examined the impact of saline lock on the incidence of phlebitis and its degree. The present study was a single-blind clinical trial (IRCT2013100214859N1) performed by the researcher on 88 patients divided into two groups of 44 each. Sampling was performed among hospitalized patients in the cardiac care units of Alzahra, Feiz, Amin, Noor, and Ali Asghar hospitals affiliated to Isfahan University of Medical Sciences, Iran, during 3 months in the year 2012. Subjects of the research were first selected through convenient sampling from patients satisfying the inclusion criteria who were then divided into two groups of control and intervention using random number table. The inclusion criteria of the present study were: Subjects being hospitalized for at least 3 days, having peripheral venous catheter in the upper extremity, and being alert enough to express the pain caused due to catheter. The exclusion criteria were: Discharge or death during the study, continuous infusion of fluid for the patient, catheter replacement for any reason other than phlebitis, unwillingness of the patient to continue cooperating, and having been prescribed immunosuppressive drugs and serum concentrations of greater than 800–900 mOsm. During the study period, any patient with conditions requiring emergency intervention, such as cardiopulmonary resuscitation, or with certain conditions, such as organ transplantation due to immunosuppressive drugs, was excluded from the study. Data collection was done using questionnaires and through interviews and observations. The first part included demographic information, data on diabetes and hypertension, information about catheter, and the medications received. The second part included the phlebitis registration form using Jackson’s VIP Scale. This scale is rated from 0 to 5 to assess the degree of phlebitis signs and symptoms depending on the site of catheter insertion and the patient’s description of pain. In this study, each of the subjects who showed a degree greater than 0 was considered to have phlebitis. To perform the study, the researcher showed the introduction letter from the School of Nursing and Midwifery, Isfahan University of Medical Sciences, and described the research objectives and gained the cooperation of authorities. Then, from among the patients admitted to coronary care units, the subjects who met the inclusion criteria were selected. After obtaining informed consents from the patients, their information form was completed. Then, depending on the vein, polyurethane catheter No. 18 or 20 was placed in the patient’s upper extremities by a qualified person. The exact date and time were recorded on the catheter using standard fixed transparent glue and at the end of the catheter, a yellow leulock was placed. If the insertion of the intravenous catheters involved problems such as multi-entry and exit, in other words, if there were problems with finding the vessel and it was tried to place the catheter in the vein more than once, the subject was excluded. The intervention group received 3 ml of 0.9% normal saline sterilized before and after each intravenous injection through leulock. If the patient did not receive any intravenous medication, the saline lock was performed every 12 h. However, in the control group which included routine drug prescriptions and patient’s serum, saline lock was not performed. During the study period, catheter placement was checked and recorded every 12 h for 72 h by the researcher who was not aware of the subjects’ categories in the control and intervention groups (single-blind). Whenever the patient gained a score of 3 or higher on the phlebitis scale, the exact date and time were recorded. The catheter was then replaced, and appropriate treatment was administered and the time of reviewing that subject ended. All the medications of the patients during the study were recorded. The results obtained in this study were analyzed using SPSS for Windows (version 16; SPSS Inc., Chicago, IL, USA), descriptive statistics such as frequency distribution and mean, and inferential statistical tests including Chi-square test, t-test, and Mann–Whitney test. The ethical considerations that have been mentioned in the “Methods” section, have been approved by Isfahan University of Medical Sciences. Of the 88 subjects examined in this study, 54.5% were women and 45.4% were men. Mean and standard deviation of age in the intervention group was 60.93 ± 10.971 and in the control group was 64.84 ± 11.816. Acute coronary syndrome was the most frequent cause of hospitalization for patients of each group. There was no statistically significant difference between the control and intervention groups regarding age, gender, intravenous drug use, diabetes, hypertension, and placing of intravenous catheter (P > 0.05). The most common location of the catheter was in the forearm in 36.4% of the control group and 50% of the intervention group. The durability of the catheter in the intervention and control groups was 67.64 ± 10.054 and 68.45 ± 11.155 h, respectively, which did not have a statistically significant difference (t = 0.361, P = 0.719). According to the results, in the first 12 h of the study (P = 0.006), 95.5% of the intervention group and 75% of the control group, and in the second 12 h (P = 0.043) of the study, 84.1% of the intervention group and 65.9% of the control group had phlebitis of 0 degree, which meant they did not have phlebitis. Mann–Whitney test showed significant differences between the two groups in terms of degrees of phlebitis (P = 0.006). Reviewing phlebitis at the third (P = 0.006) and fourth (P = 0.001) 12 h using Mann–Whitney test showed that the two groups had statistically significant differences with regard to the incidence of phlebitis measures. Distribution of phlebitis in the third and fourth 12 h is given in [Table 2]. In the fifth (P = 0.005) and sixth (P = 0.003) 12 h, Mann–Whitney test showed statistically significant differences between the two groups. Distribution of phlebitis at the end of the 72 h is given in [Table 3]. Results of the study showed that the incidence of phlebitis in the control group was 34.1% on the first day, 72.2% on the second day, and 88.6% on the third day; in the intervention group, the incidence was 11.4% on the first day, 29.5% on the second day, and 43.2% on the third day. Chi-square test showed a statistically significant difference between the two groups on the first day (χ2 = 6.471, P < 0.001), second day (χ2 = 16.418, P < 0.001), and third day (χ2 = 6.471, P < 0.230001), which means that with increased duration of catheterization, phlebitis also increased. The chance of occurrence of phlebitis in the control group (without saline lock) was 10.3 times higher than in the intervention group (with saline lock) (OR = 10.263, CI = 3.397–31.990). Regarding the degree of incidence of phlebitis in the present study, the highest rates of phlebitis were related to grade 1, 2, and then 3 and 4. In the descriptive study of Sing et al., results showed that the frequency of phlebitis degree 1 and 2 was higher than grade 3 and 4. In the study by Oliveira et al., grade 2 of phlebitis was reported to be higher than other measures. In the study of Ali Ramaei, most cases of phlebitis were related to first, second, third, and forth degrees; these results were consistent with the results of the present study. Given the significant difference in terms of the degree of phlebitis between the two groups in the present study, it can be concluded that in the intervention group, using saline lock was effective in reducing the severity of phlebitis. Since one of the most important duties of nursing care is to check catheter placement to prevent phlebitis, it is expected that prevention and care take place before the symptoms of severe phlebitis develop. Thus, higher degrees of phlebitis should be seen to a much lesser extent. This indicates that nurses should have sufficient knowledge of safe management of intravenous therapy. Moreover, like all aspects of health care, intravenous management should be performed with the highest quality and based on evidence. So that by taking care, the development of phlebitis symptoms is prevented or minimized. The results showed that in both groups, with increased duration of catheterization, the phlebitis rates also increased. Other studies have shown a relationship between the duration of catheter placement and the incidence of phlebitis. In a descriptive study by Uslusoy, the incidence of phlebitis on the third day was higher than that on the first and second days. In the study by Powell et al., the incidence of phlebitis on the first and second days was less than that on the third day. In the studies by Ghadami and Tripathi, the incidence of phlebitis increased over time. The results of all of these researches were consistent with the present study. Results of the present study showed that performing saline lock in the intervention group compared with the control group, which did not have saline lock, had a significant impact in reducing the incidence of phlebitis during this study. In the first few days, saline lock had led to a reduction in the incidence of phlebitis. Venous catheter placement can cause mechanical damage to the vessel and it cannot be prevented. However, the damage caused by chemical injection and, in some cases, the incompatibility between the drugs remaining in the catheter track and the drugs that are prescribed following that can be prevented by washing the venous catheter using a saline lock. Furthermore, another factor involved in the saline lock effect is the prevention of bacterial colonization. Flushing the intravenous catheter with normal saline prevents the accumulation of bacteria, proteins, and platelets suspended in plasma. It is through these mechanisms that saline lock prevents and reduces phlebitis. In order to confirm the results of this study, some resources have mentioned that flushing the intravenous catheter with normal saline, in addition to maintaining the intravenous catheter can be effective in the prevention of phlebitis. Fujita et al. found that saline lock method and heparin lock method can prevent the incidence of phlebitis, extravasation, and occlusion. The study by Sevrina compared two groups; in one group, 5 ml saline lock was used every 24 h and in the other group, this method was not used. This study showed that there was no difference between the groups regarding the incidence of phlebitis and the opening of intravenous catheter. In the studies by Campbell et al., phlebitis, blockage, leakage, and infections occurred more in the group with higher saline lock frequency. The differences in the final results of these studies may be due to the differences the in saline lock method, the amount, and its sampling location in other wards. Overall, the results of this study showed that saline lock reduced the incidence of phlebitis. Moreover, this method was effective in reducing the severity of phlebitis. But the amount of phlebitis was still high compared to the results of other studies. However, given that many factors are involved in causing phlebitis, more research on the number of times it is used to have the maximum impact on reducing the incidence of phlebitis, controlling the other factors effective on reducing phlebitis is necessary. Today, saline lock has been forgotten in many hospitals. Based on the results of this study, nurses, especially in the cardiac care units, can be taught and encouraged to use this method. By expressing its useful features, this method can be replaced by the routine care methods of peripheral venous catheter. This method can reduce phlebitis, prevent possible drug interactions caused by simultaneous prescription of multiple drugs, and prevent the rising medical costs resulting from the hospitalization of patients and using equipments. However, given that this method can prevent catheter occlusion, using this method can also reduce the frequency of catheter replacement, so that greater convenience is provided for the patient. This article was derived from a master thesis of Raziyeh Gadiriyan with project number 392007, approved by Isfahan University of Medical Sciences, Iran, the registration number as commented in the Methods section. Our appreciation goes to the CCU staff of Alzahra, Feiz, Amin, Noor, and Ali Asghar hospitals for helping us conduct this research. Weinstein S, Plumer A. Plumer’s Principle and practice of Intravenous Therapy. Phileldelphia: Lippincott and Williams and Wilkins; 2007. Zingg W, Pittet D. Peripheral venouse catheters: An under-evaluated problem. Int J Antimicrob Agents 2009;34(Suppl 4):S38-42. Andriyani R, Irawan Satari H, Amaila P. Duration of peripheral intravenous catheter use and development of phlebitis. Paediatr Indones 2013;53:117-20. Higginson R, Parry A. Phlebitis: Treatment, care and prevention. Nurs Times 2011;107:18-21. Rmayy AN. Assessment of phlebitis caused by intravenous catheters in patients hospitalized in I. C. U. Beast City Medical Center. Oromiyeh J Nurs Midwifery 2008;3:127-34. Malach T, Jerassy Z, Rudensky B, Schleshng Y, Broide E, Olsha O, et al. Prospective surveillance of phlebitis associated with peripheral intravenouse catheters. Am J Infect Control 2006;34:308-12. Do Rego Furtado LC. Maintenance of Peripheral Venouse Access and Its Impact on the Development of Phlebitis. J Infus Nurs 2011;34:382-90. Dougherty L, Lamb J. Intravenouse therapy in nursing procedure. United States: Blackwell; 2008. Management of peripheral intravenous devices. Best Pract The Joanna Briggs Insttitute 2008;12:1-4. Uslusoy E, Mete S. Predisposing factors to phlebitis in patients with peripheral intravenous catheters: A descriptive study. J Am Acad Nurse Pract 2008;20:172-80. Gallant P, Schultz AA. Evaluation of a visual Infusion phlebitis Scale for determining Appropriate Discontinuation of peripheral intravenouse catheters. J Infus Nurs 2006;26:338-45. Zheng G, Yang L, Chu JF, Chen HY. Aloe Vera for Prevantion and Treatment of Infusion Phlebitis. Cochrane Database Syst Rev 2014;6:CD009162. Dougherty L, Lister S. The Royal Mastern hospital manual of clinical nursing procedures. 8th ed. Canada. 2011. Fujita T, Namiki T, Suzuki T, Yamamoto E. Normal Saline Flushing for Maintenence of Peripheral Intravenouse Sites. J Clin Nurs 2005;15:103-4. Bertolino G, Pitassi A, Tinelli C, Staniscia A, Guglielmana B, Scudeller L, et al. Intermittent Flushing With Heparin Versus Saline for Maintenance of Peripheral Intravenouse Catheters in Medical Department: Apragmatic Cluster-Randomized Controlled Study. Worldviews Evid Based Nurs 2012;9:221-6. Alexander H. Heparin Versus Normal Saline as a Flush Solution. Int J Adv Sci Art 2010;1: 63-75. Campbell SG, Trojanowski J, Ackroyd-Stolarz SA. How Often Should Peripheral Intravenous Catheters in Ambolatory Patients Be Flushed? J Infus Nurs 2005;28:399-404. Myrianthefs P, Sifaki M, Samara I, Baltopoulos G. The epidemiology of peripheral vein complications: Evaluation of the efficiency of differing methods for the maintenance of catheter patency and thrombophlebitis prevention. J Eval Clin Pract 2005;11:85-9. Niel-Weise BS, stujnen T, Van den Broek PJ. Should in- line Filters Be Used in Peripheral Intravenous catheters to Prevent Infusion-Related Phlebitis? A Systematic Review of Randomized Controlled Trials. Anesth Analg 2010;110:1624-9. Writers of the graduate school of nursing, UK. Translated by Ghahremani M, Reza Khajoui M. Infusion therapy standard. Tehran: Simindokht Publications; 2006. Singh R, Bhandary S, Pun KD. Peripheral intravenouse catheter ralated phlebitis and its contributing factors among adult population at UK teaching hospital. Kathmandu Univ Med J 2008;6:443-7. Oliveira AS, Veiga P, Parriera P. Incidence of phlebitis in patient with peripheral intravenous catheters: The influence of some risk factors. Aust Adv Nurs 2010;30:32-9. Kaur P, Thakur R, Kaur S, Bhalla A. Assessment of risk factors of phlebitis amongst intravenous cannulated patient. Nus Midwifery Res J 2011;7:106-14. Powell J, Tarnow KG, Perucca R. The Relationship Between Peripheral Intravenous Catheter Indowell Time and Incidence of Phlebitis. J Infus Nurs 2008;31:39-45. Ghadami A. Prevalence and comparison of creating phlebitis in patients regarding time of intravenous insertion during 24, 48, 72, and 96 hours. Rahavard-e-danesh 2000;3:27-30. Tripathi S, Kaushik V, Singh V. Peripheral IVs: Factors Affecting Complication and Patency -A Randomized Controlled Trial. J Infus Nurs 2008;31:182-8. Hadaway L. Extra Extra Preventing extravasation. 2010; Available from: http://www.nursingmadeincrediblyeasy.com[Last accessed on 9/03/2014 2014 Mar 09]. Webb JJ. Nursing research and evidence-based practice. Contemporary Nursing: Issues, trends, and management.American, Amazoon 2011. p. 101-21. Sevrina RC. Effect of Normal saline flush on patency of peripheral venous catheters for the prevention of thrombophlebitis–A randomized control trial. Belgaum, Karnataka: KLE University; 2013.